In a short 48-hour period, EPD received reports of 5 vehicle burglaries, 4 business or residence burglaries, and 1 stolen car. Welcome to Eureka, Humboldt County's Crime Capitol. 9:07 a.m. A resident in the 800 block of 17th Street reported a vehicle burglary. 11:31 a.m. A resident in the 2700 block of R Street reported a vehicle burglary. 3:41 p.m. A resident in the 800 block of 15th Street reported a residence burglary. 4:10 p.m. A resident in the 2900 block of G Street reported a vehicle stolen. 7:04 a.m. A local business in the 500 block of G Street reported an attempted burglary. An unknown subject broke the main door and attempted to break through the second door. No entry was made to the business. 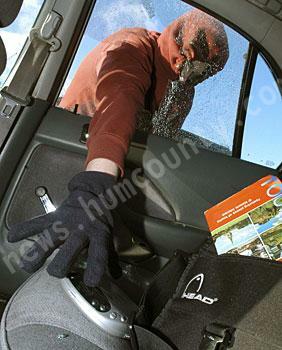 8:10 a.m. A resident in the 1900 block of Russ Street reported a vehicle burglary. 9:39 a.m. A local business in the 400 block of Fifth Street reported a burglary. Officers took a report of the incident, which remains under investigation. 9:41 a.m. A resident in the 2400 block of 23rd Street reported a vehicle burglary. 6:20 p.m. A resident in the 200 block of Henderson Street reported a residence burglary. 6:46 p.m. A resident in the 2000 block of Fairfield Street reported a vehicle burglary. 7:09 p.m. A resident in the 1800 block of C Street reported a residence burglary.